I’m currently on my annual holiday in France, but I’m having a grim old vinous time of it. This year we’ve found a villa in the Hautes-Pyranees, an area known less for its wine than for growing a lot of corn and then stuffing it down the necks of geese. Interesting wine shops do exist, but today (day seven) was the first time I saw one that was open, and a hungry child stopped me going into it (my own hungry child, I should add – France isn’t yet overrun with famished shop-obstructing street urchins). This was in a town called Vic en Bigorre, where a market-stall-manning local I asked for a restaurant tip pointed me in the direction of a place called Le Familia, just next to the main covered market. 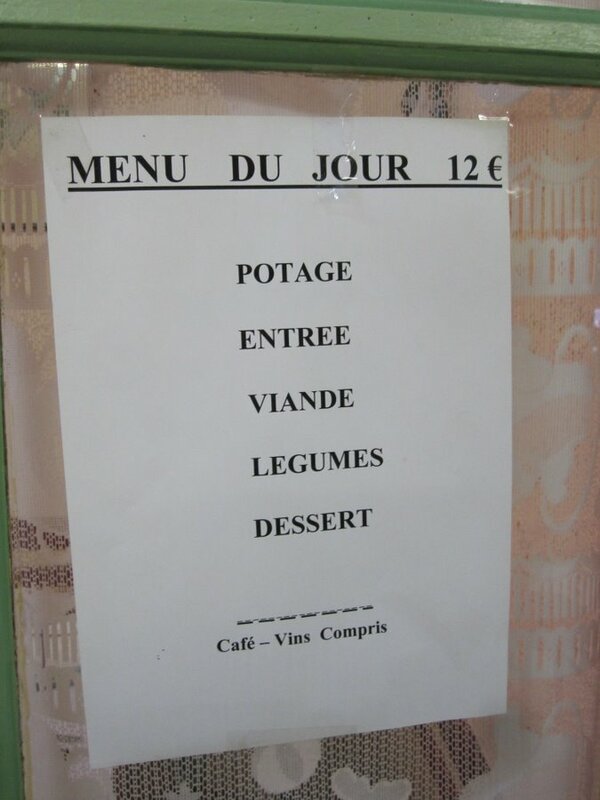 The menu was exceedingly promising, reading, in its entirety: potage, entrée, viande, legumes, desert – €12, vin et café compris. For the non-French-speakers among you, that’s: soup, starter, meat, vegetables, pudding, with wine and coffee thrown in, for €12. The choice, such as it was, was thus: red wine, or rose? They didn’t even have white, that’s how little choice they offered – though they did agree to knock something special up foodwise for the kids (namely a thick slice of ham and loads of extra salty chips). One of the people I was with was vegetarian; she was given an avocado to start (and a lettuce leaf, to be fair. Plus they had graciously sliced the avocado in half and removed the stone), and for her main course got exactly the same vegetables as everyone else (chips and brocolli), only without the viande. I basked in the authenticity of it all, as the room filled up with pensioners sitting alone and the occasional relaxed couple, while the families who had the foresight to book basked in the small pavement terrace. Everyone was welcomed by name, clearly enticed to return by the crazy prices (not the food, so much, though it was fine). The toilets were dirty, the service brusque. I loved it. Go. In Britain, of course, where duty on a bottle of wine, plus VAT on that duty, is £2.17 (with VAT still to pay on the cost of the actual wine), and where restaurants think nothing of charging three times retail prices (or more) for wine, it is pretty much impossible to get a single bottle of plonk, however hideous, for the price that Le Familia charge for a well-lubricated four-course meal. Infuriating, and I might be more inclined to protest about it as well if I weren’t still so ruddy full. This is probably the best-timed holiday I’ve ever had, coming as it does at the end of a period of loopy work pressure (serves me right for taking a big freelance commission I probably should have avoided) that coincided with a fairly stressful house-buying process – we exchanged the day before we flew to France. Sadly, the moment it ends I’ll be cast headlong back into an even more intense period of already-accepted freelance work coupled with preparations for actually moving, which happens a fortnight after our return. Which is why I haven’t been doing much blogging of late. Sorry. Normal service will be resumed shortly. This entry was posted in Uncategorized and tagged bargain lunches, Eating out, France, la familia, restaurant review, vic en bigorre. Bookmark the permalink. This is lots of changes in your life at the moment. Hope you will enjoy the rest of the holidays in France with good weather. Happy and smooth moving as well.